IBM WebSphere Application Server V8.5 Liberty profile is a flexible and dynamic server profile of WAS which enables the WAS server to deploy only required custom features instead of deploying a big set of available JEE components. What is Liberty profile in IBM WAS? Liberty Profile is part of IBM WebSphere Application Server V8.5.5.5. 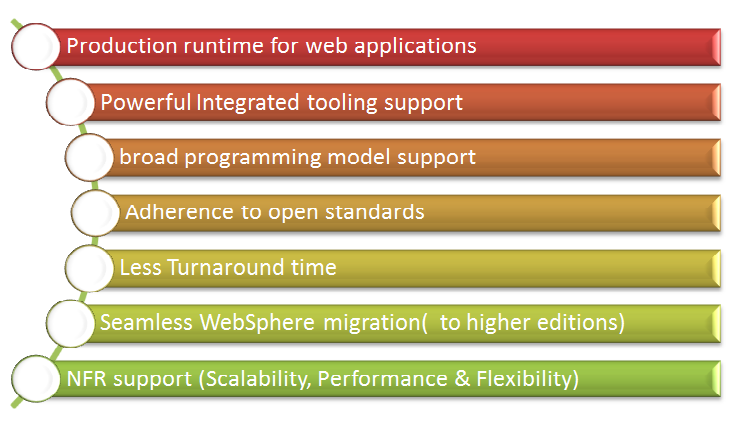 It is very lightweight profile of WebSphere Application Server. Liberty profile is a flexible and dynamic profile of WAS which enables the WAS server to deploy only required custom features instead of deploying a big set of available JEE components. 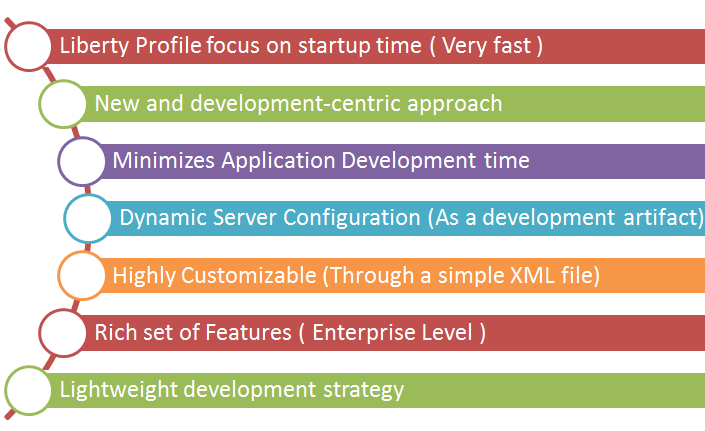 Developers can choose required features based on business requirement and push it to app server. WAS Liberty profile is best suited for developers working on mission critical enterprise applications. It could be even used for production deployment. Current version of IBM WAS Liberty profile is Java EE 6 complaint and works well for applications using this Java EE 6 certified web profile. Liberty profile is also known as light weight, down sized version of WAS starting from 8.5. We can choose to use the same for application development if we have limited and well defined set of server components. 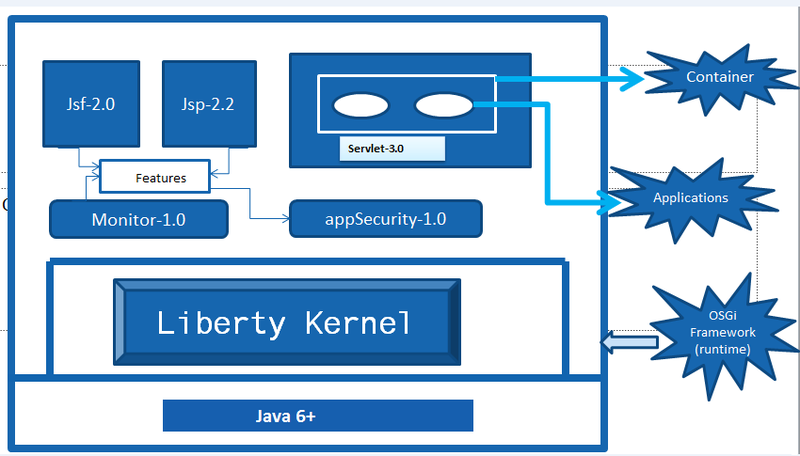 Liberty Kernel: It is the core server profile component. Features: JSP, JSF, Web App Security, Servlet, JMS etc. How WAS Liberty Profile Works? If web-application requires only a servlet engine, then rather than starting all other components liberty profile only starts the WAS kernel, the HTTP transport and the web container so that developers can quickly start and deploy the applications. If an application needs persistence feature in their application and would like to use JPA Provider component to access relational data (RDBMS), developer just need to add JPA configuration in XML and Liberty profile will make it available persistence in the application. The set of features which we will define in <featureManager> tag describes the concrete profile for the configured server specific instance and then those lists of features are tailored for the application deployed to the application server. Internally, these features are a discrete set of JARs which is nothing but the OSGi bundles which are initialized and started as soon as they are added to the server configuration file (e.g. server.xml ). <feature> tag is use to define app specific JEE features. The Liberty profile works on a dynamic runtime environment known as OSGi runtime. OSGi services are used to manage JEE based component lifecycles, and the injection of dependencies and their runtime configuration. After this step server process and comprises a single JVM, known as the Liberty kernel, and any number of optional features required by the applications. After that configured feature code and most of the kernel code both runs as independent OSGi bundles or OSGi modules within an OSGi framework (Open System Gateway). OSGi framework follows OSGi Lifecycle for their Bundles. 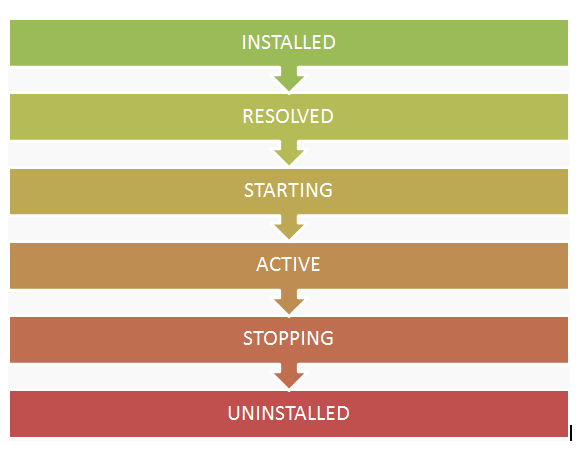 Below is the typical lifecycle of OSGi. How to Install WAS Liberty profile? From within your Eclipse IDE. As a standalone JAR file that you install from the command line. Why should I use WAS Liberty Profile? As per above default server.xml configuration basically enables the JSP 2.2 feature, which depends on the Servlet 3.0 feature; hence the Servlet feature is automatically enabled. We need not to call and define it explicitly in WAS server.xml configuration file. Below are some code snippet to configure WAS Liberty Profile. We can use the same as and when required in the application development. above code will enable servlet-3.0 API and myLocalConnector-1.x for the configured application in the IBM WebSphere Server. <application id="TestWebApp" location="WebApps/Test.war" name="TestWebApp" type="war"
above code will enable servlet-3.0 API and a dependent WAR file named as Test.WAR under web application TestWebApp. above code will enable jndi-1.0 version for application. above code will enable java client api v7 and apply this to when deploy as an EAR file. above code will enable jdbc-4.0 API and enable configured database name based on jndi lookup. Below Oracle JEE/J2EE/JSR specifications are available in stable IBM WAS Liberty profile. Developers can configure any features using above code snippets based on application requirement. 1. The Liberty Profile is free to use which is good but only in development environment not in production environment. If we want to move to production with the Liberty Profile we will anyways need to pay the usual IBM WAS licensing cost which does not sounds good. 2. There are other Lightweight servers out there today in the market which is free even for Production environment so choosing Liberty profile over those options still need to be evaluated. 3. The Liberty Profile does not provide any UI like administrative console to perform server specific useful configuration actions like updating the server config or installing/uninstalling applications etc. so we have to rely on Eclipse/RAD/NetBeans editor to update the server.xml file or we have to manually modify it which does not look a feasible option for developers. 4. Application developers compare this server to Tomcat and Glassfish which have already been around for many years so it could be one of the biggest challenges for moving to liberty profile. 5. In latest version liberty profile is coming up with lot of new features so it will be interesting to see how the Liberty Profile handles the increase functionality load with both footprint and size (approx. 60MB). 6. For Lower IBM WebSphere Server versions (5, 6, 7) it is not compatible which could be a challenge for developers and applications using them. In a nutshell we can say that Liberty Profile is one of the fastest changing and most interesting app servers to watch on the market today. So we should really focus on their upcoming releases. New Beta versions are coming up very quickly in the market with lot of new features which can use in our applications with just a simple configuration. IBM should really focus on building UI and some Migration Apps for Liberty Profile developers so that they can rapidly adopt it as compare to other major competitors like Tomcat, Glassfish, Joss etc. It will be really interesting to see how the latest versions of Liberty Profile handle the increase functionality with both footprint and size which is the major plus with IBM WAS Liberty Profile.